*To claim your prize please leave your house and look for birds. And, no, we’re not responsible if you get hit by a truck, a tree falls on you, or you stand downwind of Jochen. In other words, bird at your own risk. How about a collection of Aiolornis incredibilis, a North American teratorn, humerus? All that remained of the Moa that stood downwind from me. Proof that birds and yeagerbombs do not mix. All very humerus. Can we have some moa these? Were these original recipe or extra crispy? A prehistoric abacus constructed from pterodactyl femurs. This is a bit confusing because the photo is rotated 90deg clockwise. This is actually the new inventory that Corey just received, spread out on the living room rug, for his new start-up business making bone-shaped jewelry at home – Pendant necklaces, big dangling earrings, bod mod decorations (for those of you that have really been stretching those holes for a long time) etc. Look for him to sell to all his friends via a sidebar advertisement on Facebook. 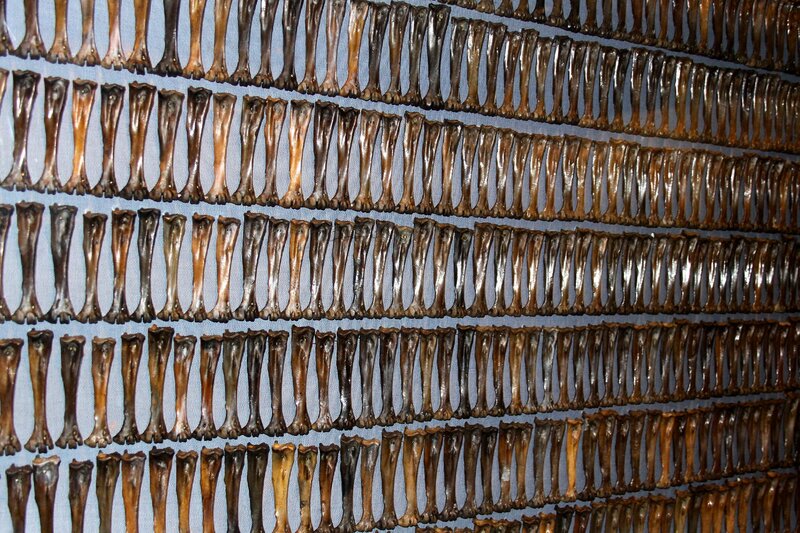 You didn’t tell me you visited the Jerky Museum! Fishing lure display at Gander Mountain…..
Actually blowing it up, this appears to be rows and rows of bats. Definitely some eyes and what looks like feet. A tibia from each bird you ever met, seduced, and eventually devoured. Didn’t I see this on a recent “Criminal Minds” episode? i know this: those are femurs of the extinct INFLATED GAS BILL…or perhaps the leg bones of the extinct FB IBIS? they knew too much…. A rare collection of legs from Chairs for Moa. Sorry about that, if I could femur of the photo I might have remembered my grade 8 anatomy lessons on bones. ” chairs for Moa” too too funny…. can’t stop the “church giggles” way to funny. “who ever said that scientific Humeru isn’t funny” ???? It’s just one of those optical illusions designed to frustrate. Madagascan Elephant bird-Aepyornis-tarsi bones. Extinct after this collection! This is definitely a collection of bird bones, tarsometatarsi to be exact. Hard to say from what type of bird with no size reference, but they look like they were awfully fatty and they are quite robust, so I am guessing they are from some penguin species? Halloween candy at the factory ready for packaging.